Actually there's no folly involved. Not yet, anyway. I just liked the alliteration. 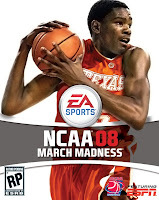 The apps are from a range of providers: There are two from companies who have a clear connection to an NCAA basketball tournament: CBS Sports (they're televising the event) and Sports Illustrated magazine. One company that has a clever ad campaign but no tie-in to basketball (Geico, using their "Caveman" as the host) and one Bracket Buster that's a unbranded app. I'll be reporting from time to time on their utility, ease of use and overall fun factor. The eldest Tadpole, a rabid basketball fan, will assist me in this task and I'll offer his POV as well. And of course they'll be brackets. CBS Sports is the only one that doesn't push you to invite your friends. It's also the only one that's holding off until the 16th (that's when the teams are announced) to actually have you start in with any kind of guessing. It's the simplest one to use and seems to have the most utility. And their "Trash Talk Wall" and Team Pages seem to have already built up some traction. SI is holding out the lure of winning money - up to $15,000. Moderate push to invite friends. Bracket Buster is all about "points" but one way to plus up your point total is to invite your friends, so there's a big sign-up push. Geico is also pushing you to invite your friends (pick the friend who does the best in choosing winners and you could win an iPod) and is also pushing Geico big time, asking you to become a Geico fan right in the instructions. Lot of action on their "Smack" message boards. Any readers with any input on these apps-- please feel free to post your comments. March Madness starts in 9 days.